You fly a large plane and shoot at tanks and helicopters. The bomb button actually fires a bunch of missiles that lock-on and track your enemies. 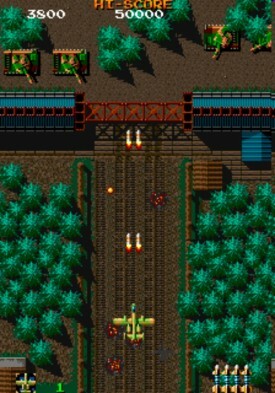 The player controls his fighting plane “FALCON” and shoots down enemies in each round of grassy plains, iceberg glacier, snowfield and city. Your final goal is to shoot down the enemies newest bomber – “DRAGON HAT”!